For the English Easter Outfit contest, we had more than 15000 gorgeous entries - that is just amazing! Thank you to all the stunning stardolls who sent their best Easter outfits in, you are stars! We were absolutely stunned by your sense of style! Our 25 lucky winners received Stardollars for some easter shopping, and here are just a few of our many favourites. Australian winner 007roz impressed with her Easter scenery, cute outfit and adorable bunny slippers! Danish doll Berry12 charmed us with her Scandinavian forest backdrop, gorgeous dress and wonderful use of the camera filters. Latvian cupcakem12m looked stunning in her Andy Warhol style glasses, totally Gaga hair and bright easter couture chic. GMonster from Russia showed off her unique sense of style with an angelic dress, dramatic makeup and a gorgeous backdrop. CallMeAriana from the UK showed that less can be more with a paired down, effortlessly chic outfit and some stunning makeup. Amarinth, from the US, really put a smile on our faces with her use of bright colours and lovely greeting. 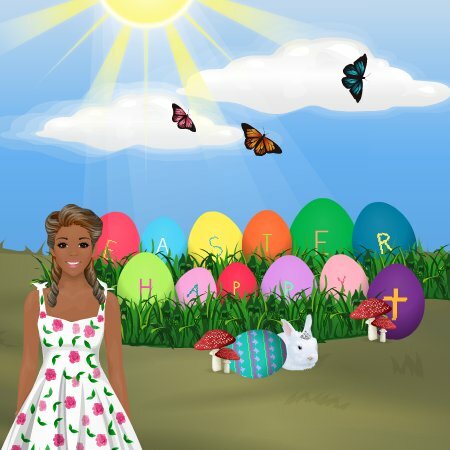 Happy easter, stardolls! We hope you have an amazing time, and keep your eyes peeled for more news to come!